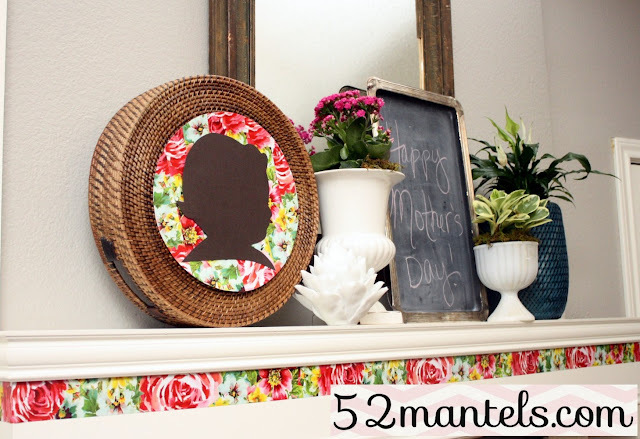 Yesterday I shared my Mother's Day Mantel, which included the sweet silhouette of my daughter. I've been wanting to do this for awhile and Mother's Day seemed like the perfect excuse. 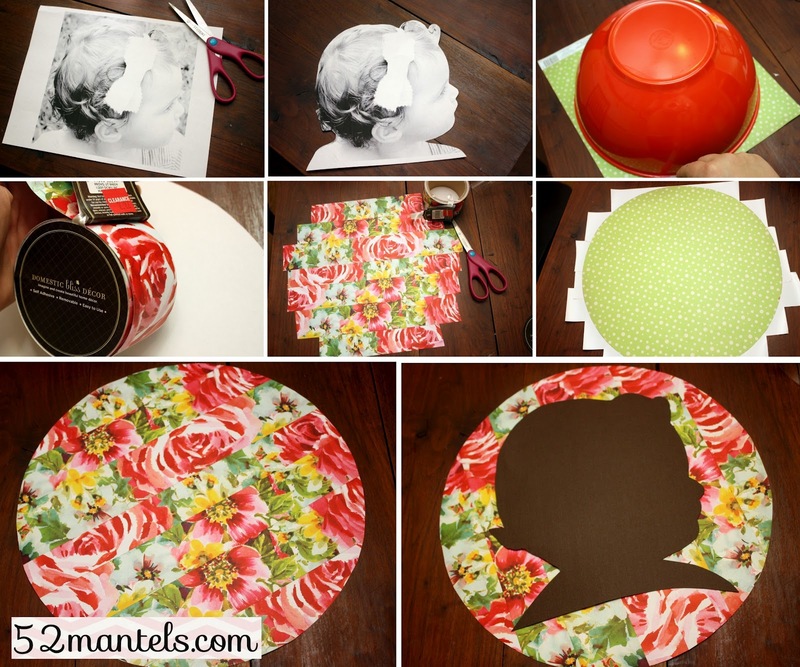 This truly is a quick and easy project! To start, I searched through 100s of pictures until I found a profile of my daughter (okay, that wasn't so quick!). If she hadn't been asleep for the night, I would have just snapped a picture of her profile and saved some time. What can I say? I don't usually plan ahead. When I'd picked an image, I cropped her face and then printed the image in black & white (to save ink). I wanted my silhouette to be large, so I set the image to fill the entire page. I then trimmed around her profile, careful to maintain the shape and contour of her face. And, her curls, of course! I then traced the profile onto brown cardstock and cut that out. Oops. Forgot to photograph that step. But, you can picture it, right? To make the circle mat, I took a piece of cardstock and traced a circle onto it using the largest bowl I own as a circle template. 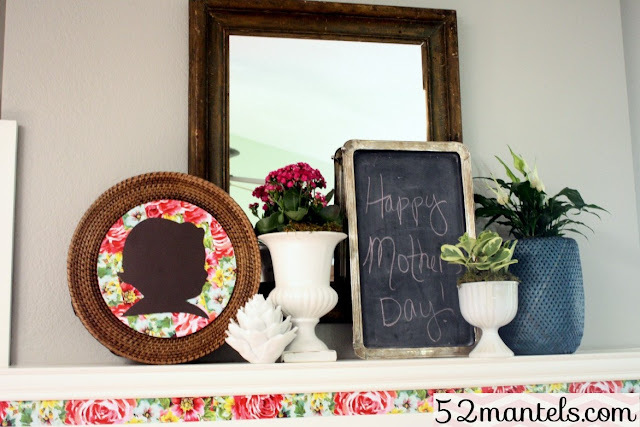 When I had my circle cut, I used the same awesome vinyl trim tape from yesterday's mantel to cover the circle. I like how the strips of tape create a choppy, segmented affect to the floral pattern. Sort of a modern take on a classic print. When my circle was covered in tape, I flipped it over and trimmed the tape. My final step was to mount the silhouette onto the floral circle using double-sided tape! Instead of framing my silhouette in a 12-inch square frame (my initial plan), I decided to use double-sided foam tape and mount it on the backside of a round, woven tray. I felt my mantel needed another textural element. But, the silhouette might end up in a frame eventually. You just never know around here. Have you done a silhouette of your little (or big!) loves? I'd love to see it, if so! So pretty! My sister has made lovely silhouettes of her children and I keep meaning to do the same. Thanks for the inspiration! Soooo beautiful! I love this! What a sweet little project, and a sweet, sweet profile! 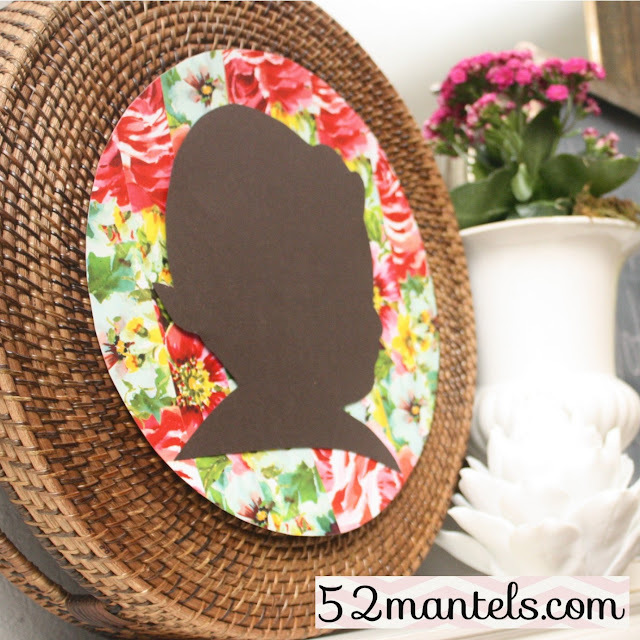 :-) I love that you mounted it to a basket -- really adds some nice texture! Thanks so much for sharing! So sweet, the curls and the little nose, oh, just adorable!